Whoa, I think this is out of bounds for SDF...! Military analysts said the fin-like flight control surfaces provided better stability for the missile as it neared a moving target, such as a US aircraft carrier. 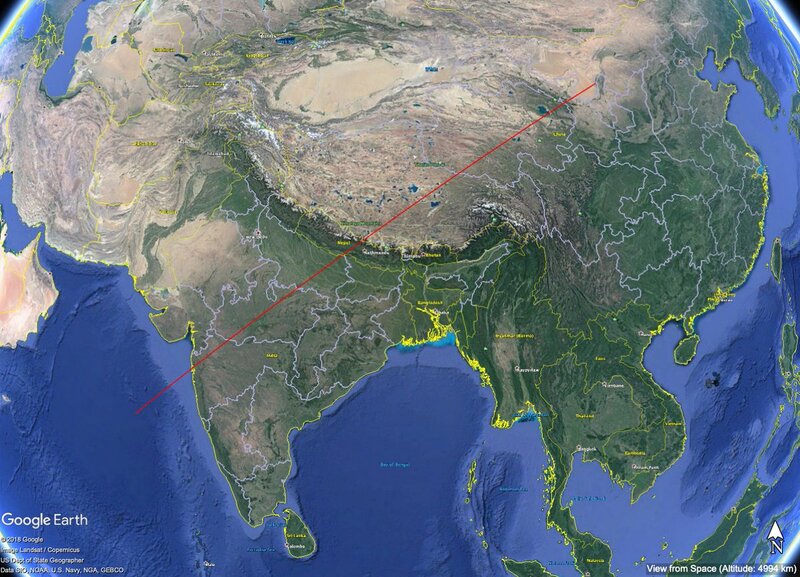 The intermediate-range ballistic missile is also known as the “Guam killer” for its range – 3,000km to 5,741km (1,864 to 3,567 miles) – that puts the US island in the western Pacific within striking distance. China’s defence ministry in April confirmed the DF-26 had been put into service with the Rocket Force. Adam Ni, a China researcher at Macquarie University in Sydney, said the latest exercise sent “a clear message to the US about China’s growing missile capability, and that it can hold at risk US strategic assets, such as carriers and bases”. 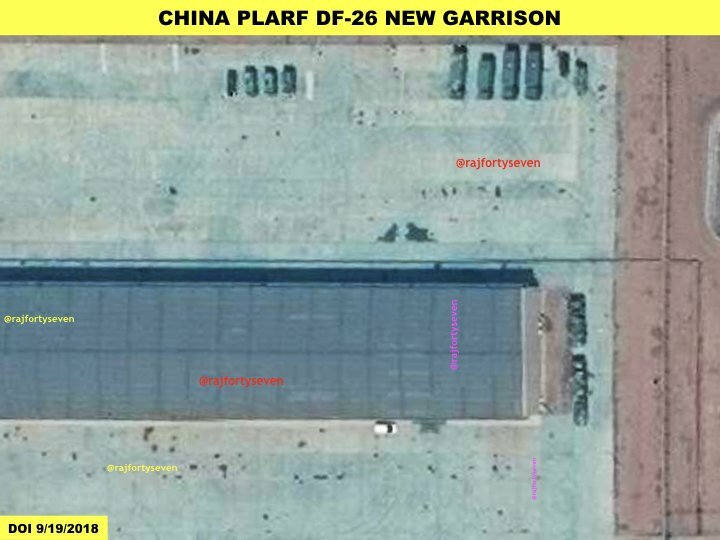 “It’s an attempt to reinforce the notion that the PLA has the capability to sink US carriers and inflict unacceptable damage on American forces,” Ni said. Footage of the exercise was released just one week after US Admiral John Richardson in Tokyo said the US Navy had not ruled out sending an aircraft carrier through the Taiwan Strait, despite China’s military technology advances posing a greater threat to its warships than ever before. Military tension between the two countries is escalating, with the US sending two warships through the strait on Thursday, and Taiwan saying multiple PLA military jets had also flown near the southern tip of the self-ruled island to the western Pacific for a drill that day. James Floyd Downes, a lecturer in comparative politics at the Chinese University of Hong Kong, said releasing footage of the missile drill was a calculated political act. Zhang Baohui, a director of the Centre for Asian Pacific Studies at Lingnan University in Hong Kong, said the drill was about deterrence amid rising tensions in the region. 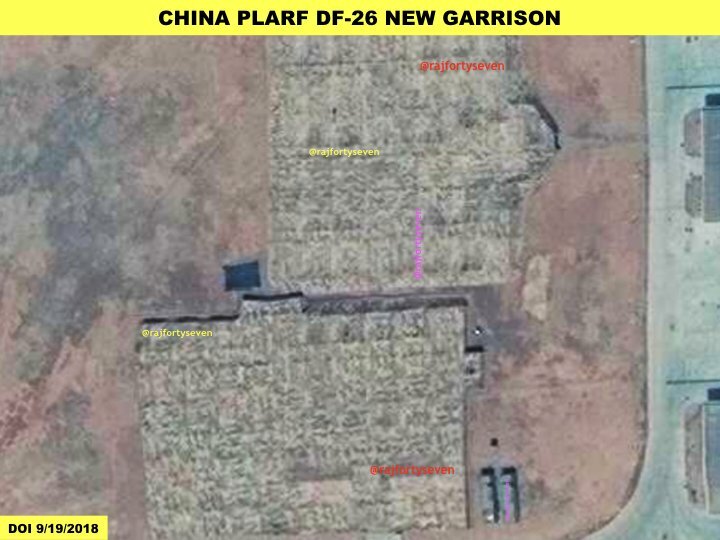 Earlier, the Chinese military mobilised its DF-26 nuclear-capable intermediate-range anti-ship missiles, also known as 'Guam Killers' for their ability to strike American military installations on the Pacific island, amid ongoing US 'freedom of navigation' missions in the South China Sea and through the Taiwan Strait. Chinese state television has released a video showing the People's Liberation Army Rocket Force firing a DF-26 intermediate-range missile. The video, filmed during a live-fire exercise somewhere in Northwest China, showed one of two DF-26 missiles which were launched last week. Speaking to China's Global Times newspaper, military observer and former Rocket Force veteran Song Zhongping said that the DF-26 is capable of altering its flight trajectory, and has guidance systems enabling it to hit a slow-moving aircraft carrier. The rocket's double-cone structure also provides it with stealth capabilities, making it more difficult to intercept, he said. "An information network connected to the warhead, which possibly includes satellites, ground and naval radar in addition to radar on the missile itself, will constantly update the location of a moving target, informing flight control where to guide the missile," a second, anonymous military expert told the newspaper. The PLA's Rocket Force commissioned its first batch of 22 DF-26 mobile missile systems last April. Earlier this month, Chinese media reported that the military had mobilised the missiles in its remote northwest plateau, presumably in response to a US guided missile destroyer's 'freedom of navigation' passage through the Paracel/Xisha Islands, which Beijing said amounted to trespassing in its territorial waters. 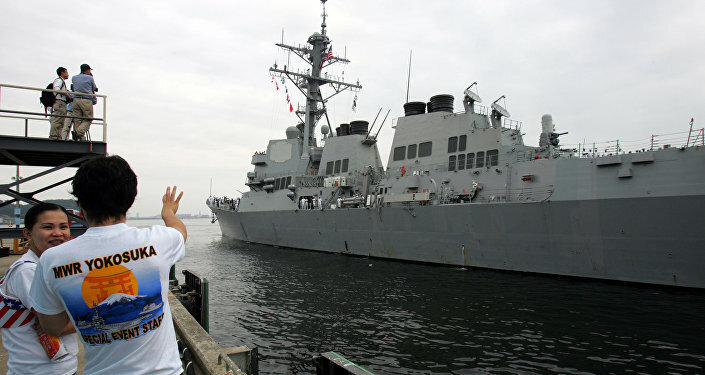 China-US tensions escalated again last week, after the US Navy sailed two vessels through the Taiwan Strait. Beijing has repeatedly called on Washington to stay clear of the strait over concerns that the US was providing military support to Taiwan. Although the island has been a self-governing entity since the end of the Chinese Civil War in 1949, Beijing considers it an integral part of China. 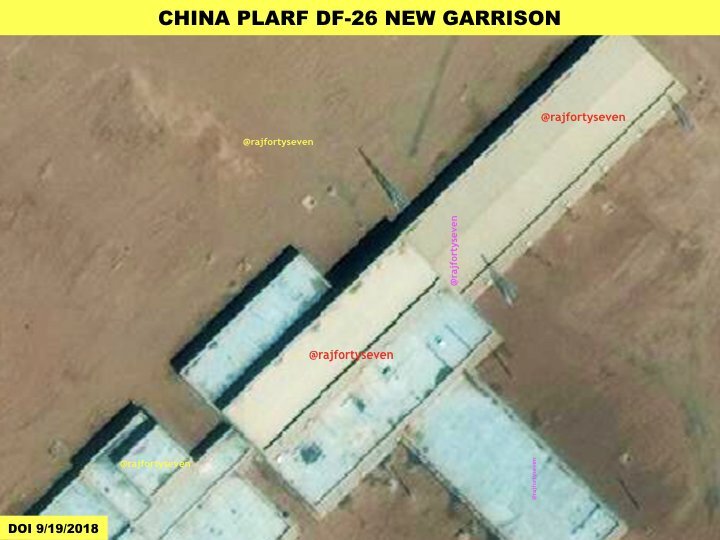 #China #PLARF #DF26 new garrison near #Alxa looks more like a permanent rocket force training facility. Covers complete #ArabianSea #BayofBengal & parts of #IOR. With innumerous launch pads, it would be difficult to track real deployments. Equation and bluewater2012 like this. why americans doesn't believe that with a radar guided marv it's possible to hit a carrier? I think that the rapid flight time of a intermediate range ballistic missile like df-26 ( i think about 10-15 minutes) mean that they also don't need to update mid course on the position of the carrier. In other words: a satellite detect the carrier, you fire the missile at that coordinates and the active radar of the marv do the rest. A carrier at 30 knots can move at maximum 15 20 km from a certain point in 10-15 minutes. What is the flaw in my logic? Ballistic Missiles leave the atmosphere so it's usually a moot point as to whether any national sovereignty is impinged! Equation, Shaolian, antiterror13 and 3 others like this.